character-uk.org is the home of SOLAR, delivering character development services in Nottingham and beyond. A multi-skilled team bringing together Sport, Outdoor Learning, Life Skills, Adventure and Risk Management to provide you with a unique range of enrichment services all in one place. We offer resources, experienced consultancy, services, training and experiences, adding engaging dimensions to learning and achievement in your school, developing children and young people through challenge, teamwork, personal attainment and social skills. Working to statutory frameworks and evidence based practice, collaborating with your team to create safer emotional and physical environments for learning, we can offer expertise and support your school right at the centre of Ofsted’s inspection agenda for Social, Moral, Spiritual and Cultural Effectiveness. Experiences that extend learning in and beyond the classroom to new contexts and challenges can help young people to develop character and grow, learning to work together, manage risk and develop important social and life skills across new environments. For more on who’s who.. 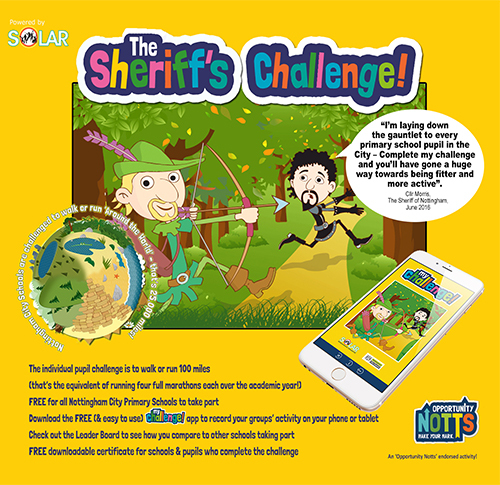 The Sheriff’s Challenge is a series of activities for all Primary school-age children encouraging them to run, walk, swim and cycle. Each academic year a different challenge will be set which will encompass a ‘joint goal’ for schools in Nottingham to cumulatively reach plus individual pupil targets. It’s FREE for schools and the benefits include promoting better health and wellbeing, children being outdoors and active, improved concentration, attainment, behavior and attendance. Nottingham City Schools have been set the challenge to cumulatively Walk or Run around the World – that’s 25,000 miles! Pupils are set the individual challenge to walk or run 100 miles – that’s the equivalent of running four full marathons each over the academic year!